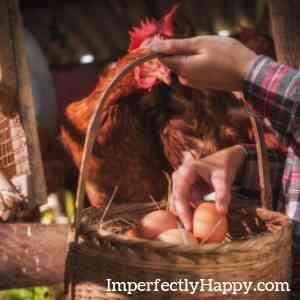 Chicken coop plans and tips for homesteaders and backyard farmers. Maybe you’re dreaming of a backyard chicken coop and looking for free DIY chicken coop plans. Or maybe you are already keeping chickens and you’re finding your chicken coop is not meeting your needs. This is the article for you! 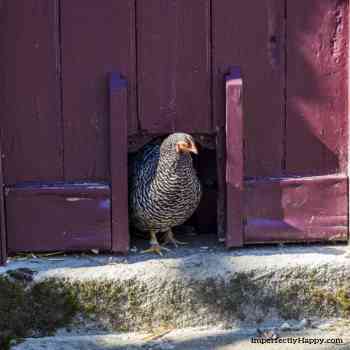 Today I’m going to share my best tips for chicken coops, chicken coop tips and maintenance and some free chicken coop plans for you to consider for a DIY project! What purpose does a chicken coop have? The purpose of a chicken coop will vary on the goals of the homesteader or backyard farmer. The basic purpose is to keep your hens safe (especially if you don’t or can’t have a rooster). 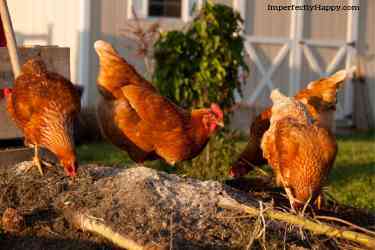 Even in a backyard, chickens can fall prey to a variety of hungry animals. Your chicken area must be predator proof! See Backyard Chicken Predators. Not to mention they need a place to sleep at night! Isn’t Better to Free Range My Chickens? I think it is great to free-range chickens! Better for their health and better for your eggs. BUT you absolutely still need a chicken coop (see reasons above). For me, my hens remain in their coop from sundown until they’ve laid their eggs for the day. Then they are allowed to roam the backyard happily eating bugs, weeds and grass. But I keep my raised beds protected from the hens, otherwise I could not allow them to free range in our mini homestead. How big should the chicken coop be? Everyone has a different opinion on how big you should build your chicken enclousure. First if you cannot allow your chickens to do any free ranging you want to give them as much space as you can “afford” on your property. I always side on bigger is better. What size chickens will you be raising? Smaller bantam breeds, like a Silkie, will need a minimum of 2 square feet per bird in the coop and 4 square feet of run space. A standard sized chicken, like a Rhode Island Red should have at least 4 square feet in the coop and 8 square feet in the run per bird. Now if you are choosing a larger chicken breed like the Jersey Giant then you’re looking at chicken coop plans for 6 to 8 square feet in the coop and more than 10 square feet in the run. Coop all the time vs some free roam time. Some people plan to only have a coop and no run because chickens are free ranging during daylight hours. How many chickens will you be keeping? How often will you be cleaning? A smaller coop is going to get messier and smell much faster! Do you want to be able to walk in your chicken coop and run? You’ll need to consider height of your enclosure too. Will your coop give your chickens protection from the elements? Can they get out of the rain? Wind? Cold and heat? Will it be easy enough for you to clean? You have to have access to nesting materials, coop and run to keep it clean for the health of you birds. What Does My Chicken Coop Need? When you are planning your chicken coop you need to consider what the coop itself will need. 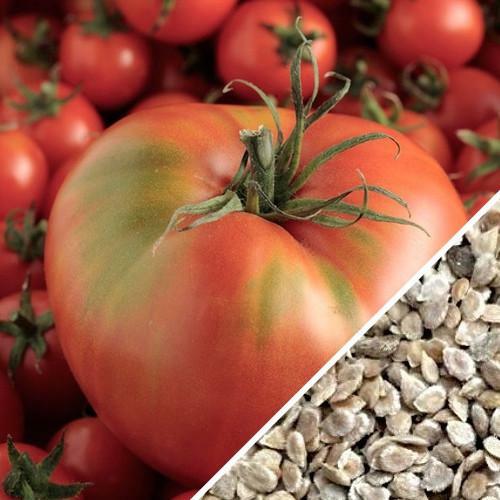 Protected Food – or you’ll be feeding rodents. I recommend investing in a treadle feeder that can only be opened by weight (chicken’s weigh a lot more than rats). Water dispenser – a hanging waterer may offer you some protection from pests. A perch or roosting bar with room enough for all birds to sleep there at night or multiple perches if necessary. 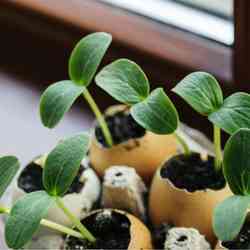 Lighting – hotly debated but if you want more eggs in the winter you may need supplemental lighting. A area for dust baths. 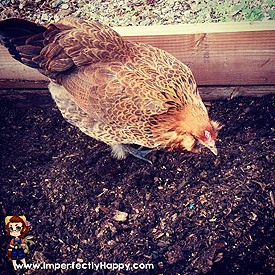 Chickens need to take regular dust baths to keep clean and parasite free. 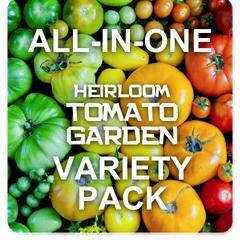 You can offer them and area or make sure you have room for the to dig their own. What is it like to start a backyard chicken coop? A small backyard chicken coop is a wonderful addition to a home. Fresh eggs, poop to compost and funny little winged dinosaurs to entertain you. But you need to know what you’re getting into. 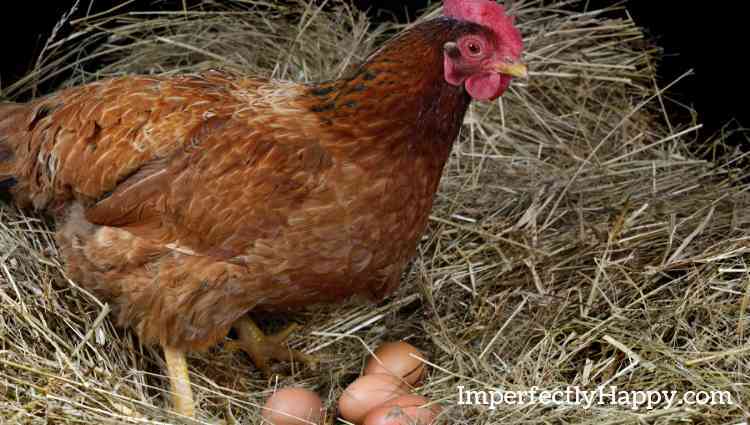 They don’t lay forever – yes you’ll need an “exit plan” for hens when they are done with laying. You can build your own chicken coop with these free DIY Chicken Coop Plans. A DIY chicken coop sounds like a money saver but before you decide to DIY ask yourself these questions. Are chicken coops really easy to build? Does the person giving you plans actually know how to build a chicken coop? Do I have any building experience or expertise? Nothing will cost you more than trying to build a coop with absolutely no knowledge of basic instruction. So if you don’t have it and can’t find someone to help you for free then is a DIY Chicken Coop Plan really saving you money? Are the materials available to me for a discount or free? Again if the materials make the coop more expensive than the kit, is it worth it? Now the difference may be that the quality of the coop is much better and will last a much longer time; making the more expensive initial investment worth it. Do you have the time to build a chicken coop? I think this one speaks for itself. If you are set on building a DIY chicken coop here are a few plans worth checking out. You really can buy just about anything on Amazon, including some decent chicken coops that you can put together yourself. But be sure to read the reviews, carefully check the dimensions and consider the materials for your area (will they hold up to the elements?). An Amazon chicken coop might be a great starter coop or one to use while you’re building your dream chicken coop. Backyard livestock is a hot topic these days. Can livestock really be raised in a traditional backyard? Yes, and you’ll be amazed what you can do! 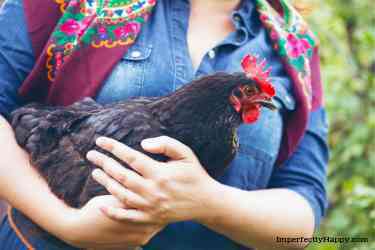 I have narrowed it down to 5 of the best choices for backyard livestock that can work for a board range of those backyard farming in neighborhoods…even HOAs! Whatever backyard livestock you decide upon remember the 3 Ps before you start: Planning, Planning and Planning. Make sure you have space for your garden and that your animals have a clean and healthy environment; we don’t want to look like a factory farm. The goal is to offer your livestock a good life while they offer you some wonderful food options. Don’t take on too much all at once. Start small and give yourself the room to add more on in the future. Animals are work – no matter how much you love them and all they offer. And they’ll need to be cared for when you’re sick or on vacation. So before you make the leap, think out all the requirements. 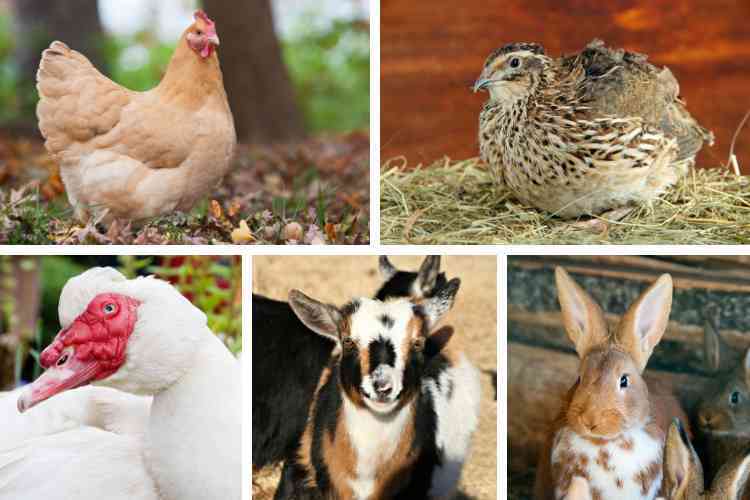 Now onto your 5 great options for Backyard Livestock! Coturnix quail are one of the best options for backyard livestock. They are small and can be housed in a variety of ways. Most conventional quail raisers will tell you cages are best but I have seen cooped quail thrive and live out a very happy life. They’ll need a minimum of 1 square foot per bird; so keep that in mind when planning your space. So what’s so great about Coturnix quail? Well for starters you can expect eggs to start coming at 6 weeks and birds are full grown by about 8 weeks old. Hens are egg laying maniacs! A single hen will lay about 300 eggs a year. 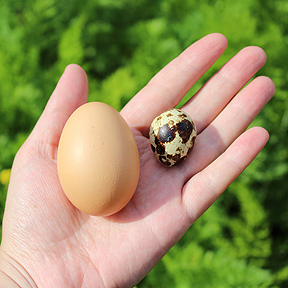 The Coturnix quail egg is about 3 or 4 to one average chicken egg – but they are creamy and delicious. There is nothing a fun as frying up some mini eggs for breakfast! Coturnix quail roosters DO make noise. I see a lot of people saying they don’t and that is simply untrue. They don’t make the same noise that chicken rooster does but it can be equally annoying to your neighbors…and you might find yourself wishing death on him at 3:00 am. Just saying. So you may want to consider keeping only hens for egg production. However quail meat is really awesome. It is a dark meat with a turkey-like flavor, delish. They are small so most people will need a few to feel like they had a full meal. However when you consider that you can process them at 8 weeks,it isn’t a lot of time to commit. They are processed quickly, no plucking needed! If you want to raise quail for meat you’ll want to keep a 4 or 5 hen to one roo ratio for best fertility. You’ll have to collect the eggs and incubate them yourself; hens are not broody. Overall quail are pretty low maintenance. Just make sure you keep them on a high protein feed, I like turkey starter with mealworm treats. If they don’t have enough protein they will cannibalize…nasty and sad. The great thing about quail is that they are often consider pets and not a livestock. This can make keeping them a lot easier than other fowl in a traditional neighborhood. Be sure to check with your zoning office. I love chickens. 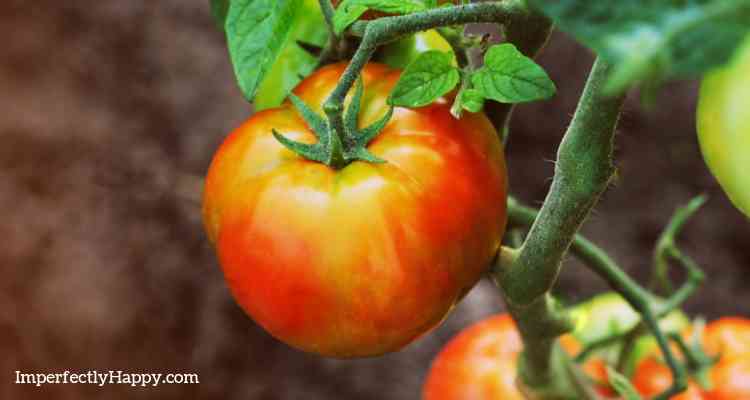 They are great for eggs and will keep your backyard free of bugs and other pests. Chickens have a lot more personality than quails so you may find yourself getting a bit more attached to your backyard ladies too. Our girls all have names. Chickens are great egg producers depending on breed. But they do take a long time to get to laying age; 4 – 8 months should be expected. Being bigger they require more space but they are happy just to have a yard to roam during the day and will coop up at night. Worried about your HOA? 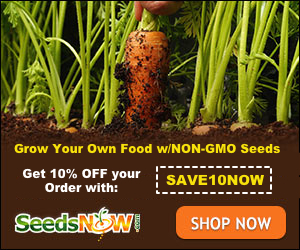 See How to Fight Your HOA for Backyard Chickens! You can’t beat a backyard chicken egg. My favorite part of the morning is coming out to the sweet egg song. Chickens are a lot of fun. Your kids will love them too. Our girls seems to favor my youngest. Raising chickens for meat as a backyard livestock is challenging. They take a few months to grow out and frankly, I find them stinky. We found that we didn’t have adequate space to give the birds quality of life. At least not to raise enough to make it worth our time. And the flies…oh good gracious the flies. Something about those meat varieties just seemed to be harder to keep the area clean and tidy. A chicken requires no less than 4 square feet of living space. This can be challenging if you want to keep them in a segregated yard. We like the chunnel (chicken tunnel) for offering backyard birds space to run safe, without taking up our valuable gardening space. What about roosters you ask? Well we don’t keep one because we’ve lost our girls once before and we want our neighbors to stay happy. But I have heard a lot of great things about the No Crow Collar but I haven’t tried it myself. I think a better option is buying fertile eggs from a reputable breeder and doing your own incubation. OR trying giving your broody girl a few to raise. Remember when your ladies are broody and sitting on eggs, they aren’t laying. Something to consider when you think about raising chicks. 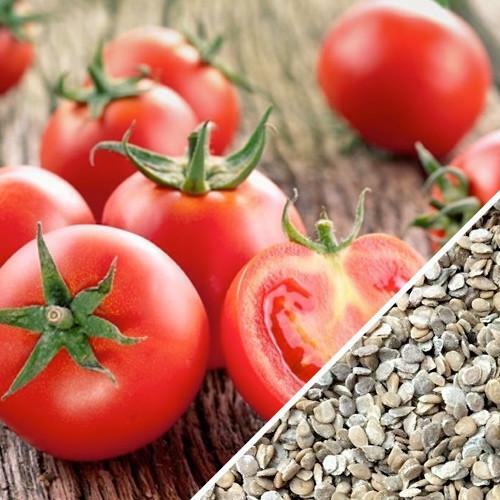 Last question you need to answer…what happens when they stop laying? Are you prepared to process your layers when they aren’t laying efficiently anymore? Most hens lay heavily for 3 years and slow down after that. If you don’t have space in your backyard for a lot of hens you’ll need to make space for new girls. If you’re not going to eat them then you need to have a plan for “retirement”. Meat rabbits are an awesome addition to your backyard livestock. 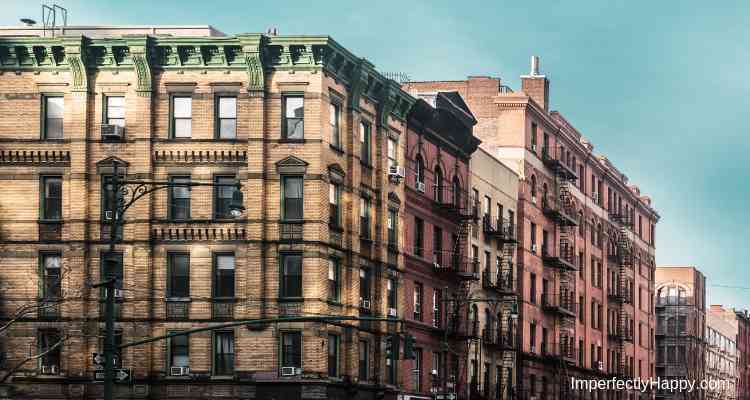 Efficient and quiet – your neighbors probably will never know you have them. Rabbits have been raised as a meat source for thousands of years. In fact Romans were raising rabbits nearly 2,000 years ago in small walled garden. During World War II, when meat rations were low, governments encouraged families to raise rabbits in the backyards to increase their meat options. 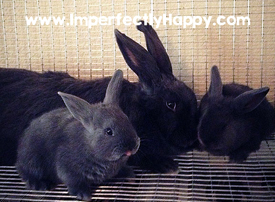 Rabbits are fairly easy to keep – they need at least a 3 x 2 foot cage. I would recommend more space instead of less. 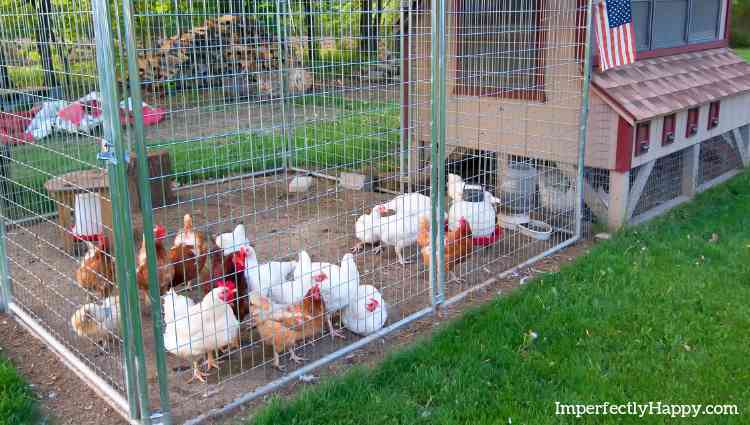 I prefer a cage system to avoid most parasites that ground rabbits are susceptible to. However many find that raising rabbits in colonies to work wonderfully and giving the rabbits a more natural life. I recommend starting with a breeding trio of 2 does and a buck. This can keep a family of 4 eating rabbit meat 1 – 2 times a week, minimum. Processing, once you are comfortable can be under 10 minutes from cage to cooler. There are a lot of humane options for this so make sure you do your research. Most will look at a pellet gun or cervical dislocation. If you can find someone with experience to walk you through your first process, great; there are also a lot of great videos on YouTube to show you. When someone asks me what rabbit tastes like…it is a lot like chicken. Mainly white meat and very lean. Special considerations – if you leave in the desert like us you’ll need to take some precautions during the heat of the summer. Rabbits need to be kept cool and will not breed during hot summer months. We use shade, frozen water bottles, fans and misters to keep everyone comfortable. 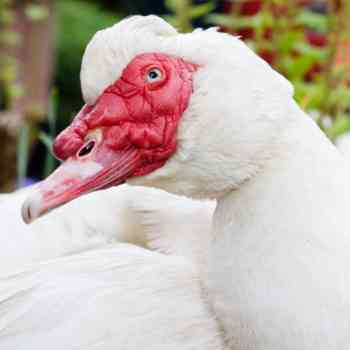 Specifically Muscovy ducks, can be a great addition to your backyard livestock. Why Muscovy? Well let’s start with the fact that the don’t quack. They make quiet hissing and pipping noises but nothing like your run-of-the-mill duck. Because of this you can even have a rooster. They also don’t need a big pond to be happy but they will need water and you’ll need to clean it a lot. Muscovies have tasty eggs and meat as well. They aren’t the proficient layers as quail or chickens but you’ll love the taste! They love to forage…and they will do so in your garden if you don’t protect it. But they’ll also eat flies, mosquitoes and snails so they are an asset in pest control. They should be kept in pairs and you’ll need to clip their wings because they are supremo fliers! When you consider housing you’ll need to make sure to offer them a roost – yep they roost. Muscovies are territorial and require more space than chickens so that is something to consider when you planning on them. They also don’t do as well in confinement. But if you decide to let them run loose, you should know that their, um, poo runs loose too. This loose stool can be an awesome natural fertilizer but you might not care if that is on your porch. The Muscovy is a great, quiet fowl. But you’ll need to make some special provisions for them. 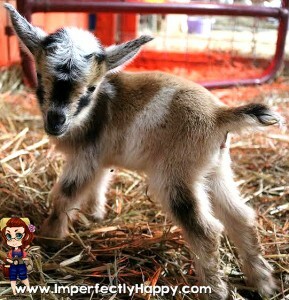 The dwarf Nigerian goat is a wonderful compact option for backyard livestock. Goat’s milk is fabulously nutritious and those who are lactose intolerant can often drink it without issue. Yummy milk, awesome cheese and tastes great in your coffee too. This great little goat is a small version takes up about a 1/4 of the space that a full sized dairy goat would need. But they do need space – most recommend at least 16 square feet per goat. And you’ll want more than one because they are a herding animal – they need a herd to be happy. So when you’re thinking about a goat think 2 goats minimum. Some want 2 dairy goats and others will keep one doe and a wether (castrated buck) for company. You also need good fencing and some housing to keep them out of the weather. They have fun personalities and you’ll enjoy being around them. Not to mention they can keep your bushes trimmed back. But goats aren’t for all backyard farms – even if you have the space. Goats are NOT quiet. They like to talk and some people find their chatter very annoying. However I have a friend that fitted her doe with a dog bark collar and after awhile she was able to remove it and the goat continued to be quiet. That is an extreme measure and it may not work for all goats. This isn’t a livestock to jump into without talking to your neighbors and checking your zoning. If you decide not to keep goats in your yard you may want to consider boarding a goat near by so you have access to that awesome milk! I hope that I’ve helped you in making some livestock decisions for your backyard homestead. I love raising animals and I am always amazed what we can do on our “micro farm”.